Here we are, entering the Holiest of weeks of the Christian calendar. It is an opportunity to be in prayer, contemplation, introspection. It is a difficult invitation to grieve if we need, reconcile if we are compelled, and repent–that is allow for transformation–so as to re-commit ourselves to what it means to be a Christ inspired disciple. It should be a difficult week, one which asks us to be in the sacred space of truth and sorrow. It should be a week that calls back into relationship with our God, with creation and community. It should be a week which challenges and inspires us to pursue Resurrection as a Divine possibility and not a frivolous gift just handed out. We are called yet again to be co-creators in this world and this is where Resurrection will, (or won’t, without us) be realized. A former classmate of mine and current UCC minster, Sara Rosenau, offers this commentary. “This expresses what has been stirring in me for the last six months or so. And especially in these last weeks as Easter season and Earth Day approach together. Isn’t Palm Sunday all about something that is worth doing no matter how it turns out? Isn’t Easter about keeping vigil for signs of Life in the face of (brutal state sanctioned) death. But what is the hope of resurrection in the face the sixth mass extinction, brought on by the destructive practices of humans? Resurrection is reclaiming a way of life, known by our deep ancestors, that is rooted in friendship, community, and communion with creation. May you, Dear Ones, have the courage to confront this Holy Week with your entire Being. May you know that you are held in your despair just as our Beloved despairs our grief and God’s own grief for this world. And may you know–eventually– the peace and comfort which comes in returning to The One who waits for us. We speak a lot of critical happenings in our world and yesterday was no exception. I want to remind us all that even when it seems that there is too much to do, we are never alone. This is not a platitude nor hollow theology. We do know that our Beloved depends on us to be co-creators in this world. But we aren’t supposed to do by ourselves. We have the communities, the tools, and the information to do this. It takes work and determination, but again, we are not alone in out attempts. We are in the company of our entire denomination and faith-filled people who seek justice for our planet. For example, Rev. Allyson Sawtell, the author of the poems in yesterday’s worship, and Rev. Peter Sawtell, live in Denver and are very actively involved in UCC eco-justice. “In 1982, the State of North Carolina chose a poor predominantly African American community for the placement of a toxic waste landfill to dispose of PCBs illegally dumped along the roadway of fourteen counties. Residents of Warren County, North Carolina enlisted the support of the United Church of Christ Commission for Racial Justice (CRJ) to engage in a campaign of nonviolent civil disobedience. As we head into Holy Week we will be focusing on the sacred trust we have been given to care for our Mother Earth. It is imperative that we understand our role is caring for the only home we have. When we can embrace that role of being co-creators in this work , I truly believe we will experience Resurrection as it was meant to be: the respect and equality for all creation, destruction of greed and empire, and the restoration of life, everlasting. 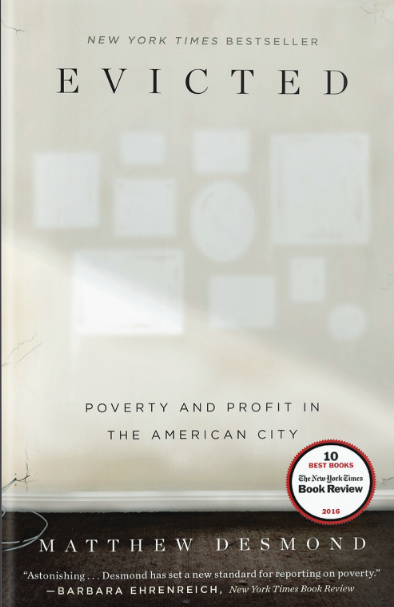 This year, at the UCC Synod in June, the keynote speaker will be Matthew Desmond, author of “Evicted: Poverty and Profit in the American City”. We, who are attending, are encouraged to read in advance. And so I am putting this info out there for you so that we can all connect with the larger church while also gaining more information. All of the missions with which we are involved, attempt to stem the effects of poverty and possible homelessness with a variety of populations. I want for you to know just how extensive this issue is; to be inspired on how to be more effective in our missions; and to know how much this community does in order to meet those who have been pushed to the margins. We will embark on the Sacred Conversations to End Racism (SC2ER) study in May. After that, it is my intention that we engage in robust conversations based on this book later in the summer. Get the book, Read the Book, and Look for upcoming opportunities for discussions! This morning as I write this blast I am also crafting the sermon for Sunday. The text is the infamous story of the Prodigal son with all of its interpretative manifestations. I offer this small preview for two reasons: First- Now you can think about it and be prepared for all of the possible ways I might go with the sermon 😝; and Second- this story is one that leaves us hanging in that there is no definitive ending. Review it, you’ll see what I mean. It is this second reason that informs what I am sharing with you today. I have a story whose ending is not yet known. I shared with you yesterday that I have been asked to participate in a prayer breakfast at the Governor’s mansion this coming Wednesday. I was told that this was a opportunity for religious diversity. This was a invitation for different religions and denominations to come together and share how prayer influences our traditions and our practices. I was also told this was a non-political event designed to maintain a desirable outcome. When we became a Just Peace church we set out on the path that Jesus took before us. The path which causes those in privilege to shudder and try to divert us from our call. It is a path which has many demands and sacrifices including sacrificing our own desire to avoid conflict at all times in the name of ‘false’ peace. This desire and ability to avoid conflict, is one of privilege. When our lives do not depend on staying on this uncomfortable path, when we can take a break for the discomfort that seeking justice creates, when we can opt out of difficult conversations, we must recognize that this is a function of our privilege. I write this as much for me as for you as I have been wrestling with the idea of just bailing on this entire venture. But that option to bail to avoid discomfort, rejection, or maintain peace so I can sleep tonight, is a privilege. ‘If the only prayer you ever say in your entire life is thank you, it will be enough.’ Meister Eckhart. Today I have to share that I am beyond grateful for all of the love and support you shared with me and Liz this past weekend. We were both so touched by your willingness to celebrate our life together and even more overwhelmed by your generosity and party throwing skills! We both hope you had as much fun as we did! This brings me to one of the most obvious, and yet most overlooked, of spiritual practices available to us: Gratitude. In a world that is at times, so distracting by its divisiveness, hatred and fear, it is often very difficult to remember to be thankful. Expressing gratitude, however, helps to divert our attention on what is going right in our lives. It helps acknowledge that in the midst of all that we think is wrong, there is so much that is good. I had a friend once tell me that she was so grateful for every feeling she had because she could simply Feel. Rather than run from her negative feelings she first offered thanks that she could experience the fullness of her humanity. This isn’t about wallowing or avoiding, but rather recognizing just how much we can experience our lives. Giving thanks also helps us to think outside of ourselves, helps us to turn our attention to the One who is the giver of every breath we take. It reminds us that we are in the unique position to not only experience the fullness of our lives, but we can also respond with understanding to others in their joy and suffering. Just by our humanity we are beautifully connected, if we can just take a moment to recognize. For this practice, see if you can start your day with one thing for which you are grateful. And as you close your day, do the same. You may find that there are too many to count, or you may find that it is the same thing each time. It doesn’t matter. All that matters is that in that moment you give thanks. With that said, on this day I give thanks, once again, for all of you. This morning begins our Journey into Lent, a spiritual journey which invites us to find ways to our Beloved. Over these next few weeks I will provide some examples of practices you may find helpful. Today, ‘Entering the Silence’, my personal favorite, it requires intentionally finding a quiet place and allowing yourself to surrender to the ’empty’ space. May you find a path that leads you home. I am offering yesterday’s reading as a Lenten point of reference as we go forward in the season of Lent. Yesterday I spoke briefly about what it means to fast with intention and from a place of abundance as opposed from a place of obligation or scarcity. The season of Lent offers us a time of reflection, a time for repentance –that is, turning back and returning to our Beloved. Fasting from those things which keep us from reaching our Home is both an invitation and a means to return. But fasting isn’t the only spiritual practice in which one can participate. We will be exploring a multiple of ways to engage spiritual practices during Lent to nudge us back to our God. Hopefully, you will find at least one of these practices something you can carry over afterwards. Let us feast on acceptance, and fast from judgment. Let us feast on bread and wine in spiritual communion, and fast from all that keeps us from communing deeply with each other and with God. So that our lives might be sufficient, fulfilled, complete, whole, enough. As you can imagine, this day began like so many others; a quick glance at the news cycle and FB postings and I was instantly reminded of the whole “love your enemy” thing again! It is so easy to get caught up in the chaos of the social and political climate that agitation and hopelessness and annoyance so easily rue the day. But yesterday, I was reminded that God is not anywhere finished with us yet. When I was in seminary, the median age of those of us attending was over 45. We were a rambunctious group, none the less. And we were ready to get out into the world and exhort the good news in the face of all the injustices and isms which prevail. However, to be clear, there was an underlying sense of ‘how do we sustain this vision if we are rounding the corner and facing our mortality sooner rather than later?’ And then, it happened: The reminder that no matter what we think is happening, no matter what we fear, the Spirit is still present and active. The group of folks who are seeking ordination in our Association these days, are young, vibrant, hopeful and determined to re-imagine church in such a way that I have no fear or doubt that we are long for this world! They epitomize the notion that God is still speaking and they remind us all of the work that needs to be done. How brilliant is it that the wisdom and experience of those who have been in ministry for a while, will intersect with the vibrancy and creative longing of young, strong, God infused people?!? And how amazing is it that our Beloved’s faith in all of us, calls us into imagining and realizing all the possibilities of the kin-dom? Amen! Alleluia! My heart is a prison of Have you tried? It is said that days such as these–cold, snowy and dark–typically offer some relief to folks who suffer depressive disorders. From past experience, I concur, as expectations to be happy aren’t as high as when the sun is shining and the air is warm. Each experience of mental illness, however, has its own manifestations of symptoms and suffering. Just as our individual life experiences are vast, so are the types of symptoms one may experience from a mental health perspective. The trick is to honor and treat with compassion those who have to live with mental illness, including ourselves. I truly believe that to do so is biblical. Historically, some ways the Bible has been interpreted has been harmful. When one reads about Jesus curing anyone with an unclean spirit, or someone possessed, it is often assumed they are sick because they have sinned and cured because of their faith. They are rejected by their community and forced to live outside the boundaries of acceptance. I have always brought my own understanding that those who are rejected are so because they are mis-understood. I would also offer that they are made sicker because their community has condemned them to live outside of its compassion and love. And their healing is about Jesus reversing that exile and bringing them home, thus exemplifying the biblical mandate that all belong and all are cherished by our Beloved. We never really know how those who have been healed do in the long run. But we do know that in the moments of intense pain and rejection, Jesus is in it with them. But we do know that in the moments of intense pain and rejection, Jesus is in it with them. We don’t have to completely understand what another is experiencing in order to be a compassionate presence. Expertise is helpful, but showing up is even more curative, at least in the moment. We area church which excels at showing up, for each other and for those whom meet each moment in our lives. And we need to be sure to offer ourselves the same grace and compassion we are willing to others. “Christianity has died in the hands of [Fundamentalists]. Evangelicalism [Fundamentalism] ceased being a religious faith tradition following Jesus’ teachings concerning justice for the betterment of humanity when it made a Faustian bargain for the sake of political influence. The beauty of the gospel message — of love, of peace and of fraternity — has been murdered by the ambitions of [government] flimflammers who have sold their souls for expediency.” (Miguel De La Torre, ‘The Death of Christianity in America’). This above is the title and the first sentence of an article in last weeks’ Sojourners magazine. It is a profoundly accurate article and the actual state of our union and I encourage you to read it. The second quote is from an article By Miguel De La Torre who will be the presenter at the James W White lecture series sponsored by First Congregational this Spring. In the meantime, I offer this as a follow up of our ongoing conversation on racism and justice. While we are a non-creedal church I offer the following as a ‘profession’ of our identity and faithfulness. I hope it gives hope and direction to our work. We are a people that holds firmly to the idea that we are first and foremost part of our God’s beloved creation. We strive to seek the presence of God in all creation, including ourselves. We emphatically proclaim love for all of God’s beauty and disdain for all that destroys it. We actively seek liberation for those oppressed by empire. We seek justice for all by maintaining our understanding that God has created us all as equals in this universe. We strive to break those systems that would lead us from the sanctity of our Beloved’s purpose and dream for creation. We also contend that we are called to hold one another accountable to the Call we all have. We have chosen the path to re-claim our Founder’s purpose to seek justice, love mercy, and walk humbly with our God. We are called, and we are chosen, to reclaim our Christian roots in order to assure the realization of our Beloved’s dream for this world! May it be so! You know we preachers have a pretty good knack of standing up and reminding you of all the woes of the worlds and our responsibility to try to remedy them. But we don’t always have practical suggestions on how to do this without feeling as if the weight of the world rests squarely on our shoulders. Today, I offer you a means to connect with ways to truly celebrate the Jubilee year we spoke about in worship. When I first read the above paragraph years ago, it resonated with my experience of church work and how it often fell short of how it was meant to be. I was fortunate enough to talk with Robin about his vision for what church could be. I remember that one of the things he described in his church was how they did communion. On the first Sunday of each month they held a community breakfast for all those who wished to attend reaching a wide swath of folk who either never came to church or who were in need of a good meal and community. This was a hands on example of what it means to truly be the church. It spoke of relationship, the extension of our understanding of church to beyond the walls of a building, and it demanded that justice be part of the paradigm. I found this perspective compelling and truly aligned with the reason for and the definition of, Christianity. I want you to now that since that time, I have been fortunate to spend quality time in a few churches. Many individuals find this idea of being active in the work of the church compelling, though the church universal may have a more difficult time embracing the call to be active participants. That being said, this place, Vista Grande, has risen as a community to really try to walk the walk in all we do. I continue to be grateful for the opportunity to be with you on this venture of living into being a Beloved community. We have and continue to strive to be a church that is relevant and that is committed to the ways of our Founder—the One who challenges us to be a beloved community in all things and in all ways. We have chosen the path to truly be evangelical, living out what Paul was revealing to the early church in Corinth. Are we willing to continue on this path? Are we willing to remain an example of the Beloved community in a world so desperate for such a thing? Are we willing to bring our gifts to be used in the service of God’s Vision for creation? Because I quite frankly think we can do even greater things! Do you? I hope this past week was a good one for you. As many of you know, I was back East for my Aunt’s funeral. It was a mixed experience: sad of course but also a real gift to see so many of my family I haven’t seen in too long. A time of loss often challenges me to examine my priorities and all that is important to me in both my personal and professional life. How appropriate that this challenge comes at a time of transition for our community as we begin this year of possibilities. Vista Grande, its mission, its ministry, its future and all of you are my priority. This means a re-commitment to what we have all said we wish to accomplishment in our local and wider community. I won’t kid you, this is going to be very demanding in terms of your time, your talents and your tithes. We will have our Annual Meeting on Sunday and you will hear and read all of the wonderful things we have been able to accomplish this past year. It is truly amazing what this church does! You will also hear/read that we are in deficit with regard of last year’s expenditures. While this may sound unnerving, please note that the greatest unbudgeted expense was for our parking lot. Thanks to the volunteers who cut the cost immensely, we were able to assure that our facility is both aesthetically inviting–but more importantly, absent of potential safety hazards. This speaks to the commitment to keep our facility and our mission going! To be clear, in order to prepare for the future of our congregation we ALL need to commit our gifts to this venture. Every financial pledge is critical for planning and sustaining all that Vista Grande is and wishes to be. If you have not yet made your financial pledge please do that now. Commitment does require some sacrifice, identifying our mission as your priority. We have been able to do great things with regard to working towards God’s vision for this world. Please take prayerful time to recognize that giving money is a spiritual practice that allows this work to continue. We cannot continue what we’ve been doing without this commitment. Thank you all for all you do. This congregation continues to amaze me with how we are the Presence of our Beloved in this world. I continue to believe that we are destined for great things in realizing the Kin-dom! You have my commitment and I know this church has yours. Epiphany is that time of light. That time when we are reminded once again of the brilliance of Beloved made manifest in our lives. One might also conclude that, for Jesus, his baptism was an epiphany: the moment when he realized who he was to be in the world, and to whom he was called to represent. What is important to remember when we listen to these stories, of the beginning of his ministry, is that it isn’t enough that we just remember. It’s not enough that we just recall our own baptismal vows that we or our parents made on our behalf. Like every other story we hear in our yearly gospel readings we are invited to enter and relive the stories. These stories are to evoke an epiphany each and every time we hear them so as to remind us that we are active participants and not passive recipients of the good news. Every day we have an opportunity to ‘renew’ ourselves and begin again our sacred participation. I invite you to remember and to relive and to re-commit yourself to what it means to be a baptized child in whom our Beloved is pleased. Well we have come to the proverbial ‘end’ of the holiday season. The trappings are put away, the lights turned off, leftovers finished or tucked in the freezer until that day when we toss them away. We are entering that down time of the year. The time when we wonder if we are really noticing that each day is getting longer, the light that has been promised secretly making its way into the cold nights. It is, notoriously, a time of year where we can slip into let down and exhaustion, our hearts wanting desperately for the hint of spring. But this is where we miss the opportunities for our own self-reflection, the invitation to recognize we already have that which we seek. Jan Richardson is a brilliant poet and mystic who offers thoughtful words to walk us through. I hope you find these beautiful poems a way to find your way as we enter a new year. I know how far you would walk to offer what is needed, the lengths you would go to provide for those you hold dear. I know how every road you travel begins in the hollow of your chest, in the chambers of your heart; how you measure your steps by the rhythm of your pulse; how you find your way across terrains no map could ever show. No distance, no barrier, no expanse of time would keep you from propelling yourself toward the place where your heart has already arrived But for a moment, for one small space of time, could you pause and in the quiet, wait for the gifts that have been gathering around you, the treasures borne by those who have been traveling to welcome you since the moment you left home? here is no reversing this road. The path that bore you here goes in one direction only, every step drawing you down a way by which you will not return. You thought arrival was everything, that your entire journey ended with kneeling in the place you had spent all to find. When you laid down your gift, release came with such ease, your treasure tumbling from your hands in awe and benediction. Now the knowledge of your leaving comes like a stone laid over your heart, the familiar path closed and not even the solace of a star to guide your way. You will set out in fear. You will set out in dream. But you will set out by that other road that lies in shadow and in dark. We cannot show you what route will take you home; that way is yours and will be found in the walking. But we tell you, you will wonder at how the light you thought you had left behind goes with you, spilling from your empty hands, shimmering beneath your homeward feet, illuminating the road with every step you take.